If I was afraid of using too many colors before, now I’m definitely not. I came to the realization that multiple colors could be really fun when used together like today’s look. Green, red, hot pink and blue. SAKs is still having its 30% off Friends and Family sale. I picked up this classic dress (on instagram here)and will show you girls soon. Tory Burch is having up to 30% off with code BLOOM and free shipping. There are so many cute things to buy like this cute bag and lace up flat espadrille. I picked more items for you girls below. Don’t forget to take a look! Such a gorge look! Love the off-shouldet top! That top is such a gorgeous color! Great look, I'm loving the distressed denim and off the shoulder top! nice outfit! I love your top! That red top is so pretty!! such a lovely pop of color!! Such a darling top! 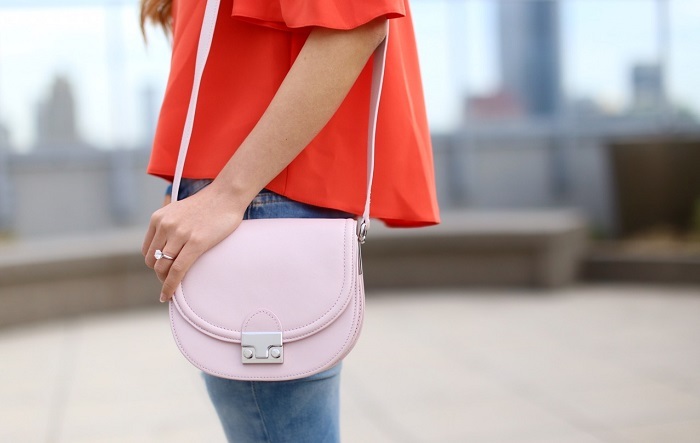 I especially love the unexpected touch of pink with the cross-body!